Outlook Backup allows users to transfer Outlook data between computers, Outlook profiles and operating systems. Outlook transfer can be also performed automaticallly using Task Builder feature of Outlook Backup. 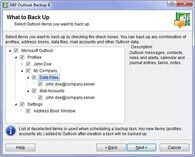 Nevertheless Outlook Backup is a program for creating backup copies of Microsoft Outlook data it also can be easily used to transfer Outlook from one PC to another. 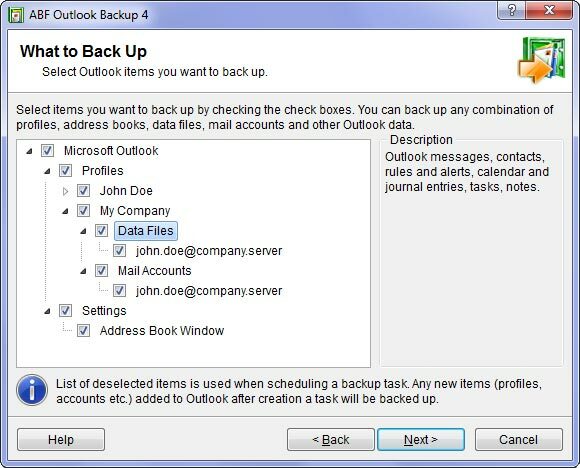 Using our backup tool you are able to transfer Outlook email messages (together with folders structure), address book contacts, mail accounts, settings, rules and much more. Backup all needed Outlook data on the computer you would like to transfer from. Install Outlook Backup on the second PC and restore your data from the file you've just moved. If you need to transfer data from one Outlook profile to another simply back up first profile and restore in the second one. Sometimes you may need to perform transfer operation periodically. Here is when the Outlook Backup scheduler comes into play. Using this feature you can schedule backup and restore operations on both PCs to automate Outlook transfer process. To add a task (we prefer to call it job) to scheduler follow the wizard to backup or restore Outlook. On confirmation step hit Advanced button and navigate to scheduler step. Choose to backup (or restore) later and configure the scheduler. When you're done complete the backup or restore process. Note: You don't have to pay any additional charges for transferring Outlook between computers. If you are a single user of the program on several computers you may use a single license on all your computers.